The 12-lead ECG and Lead II rhythm strip in Figure 1 was obtained from a patient admitted for an exacerbation of his COPD (chronic obstructive pulmonary disease) He is hemodynamically stable. His tracing was interpreted as showing baseline artifact (understandable given his level of dyspnea) – and sinus tachycardia. Do you agree? Figure 1: 12-lead ECG and Lead II rhythm strip from a patient with COPD. Is this sinus tachycardia? – NOTE – Enlarge by clicking on Figures – Right-Click to open in a separate window. INTERPRETATION: The presence of baseline artifact often makes the interpretation of an ECG more difficult. That said – artifact is a common phenomenon, and an optimal quality tracing may sometimes be an elusive goal in an acutely ill patient. The amount of artifact in Figure 1 is not excessive, and should not impede diagnosis of this arrhythmia. The overall rhythm is rapid and regular. The R-R interval is almost exactly 2 large boxes in duration – establishing the rate at ~150/minute. The QRS complex is narrow (not more than half a large box in duration). On initial inspection – we are uncertain about the presence and nature of P waves. A clearly defined, upright P wave in lead II is missing. That said – there appears to be at least some type of atrial activity in the lead II rhythm strip at the bottom of the tracing. 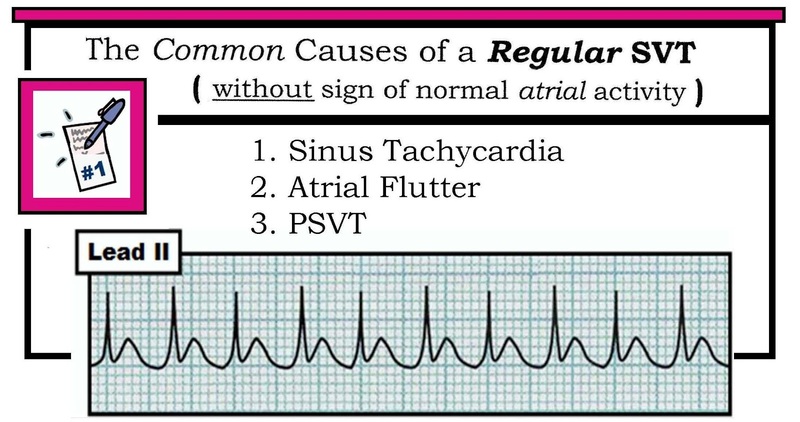 Recognition that the rhythm is a regular SVT without normal atrial activity should immediately bring to mind the differential diagnosis of 3 common entities: i) Sinus tachycardia; ii) Atrial flutter; and iii) PSVT (Table 1). The “beauty” of this list – is that it hones the emergency care provider’s attention to the 3 principal causes that make up the vast majority of cases. NOTE: AFib (Atrial Fibrillation) is not included in the regular SVT LIST shown in Table 1 – because AFib is not regular. We also chose not to include Atrial Tachycardia with 2:1 AV conduction in this LIST, because in our experience ATach is much less common than the other 3 entities — and, for 2:1 conduction with a ventricular rate of ≥140/minute, this would entail an atrial rate of ~280/minute — which is significantly faster than is usually seen with ATach. Table 1: Common causes of a regular SVT without normal atrial activity. The 3 entities listed make up over 90% of cases of what is commonly seen. 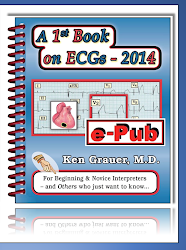 (Reproduced from ACLS-2013-ePub). IF the rate of the regular SVT is faster (ie, over 170/minute) – the diagnosis would almost certainly be PSVT. This is not the case in Figure 1 – which means that all 3 of the entities in the LIST must be considered. 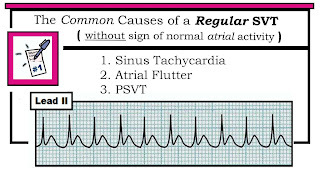 Statistically – the most commonly overlooked SVT rhythm is AFlutter (Atrial Flutter). This is because flutter activity may be subtle, and is not always visible in all 12 leads. By far – the most common ventricular response to AFlutter is with 2:1 AV conduction (atrial rate ~300/minute; ventricular rate ~150/minute). Therefore – One should always “Think flutter until proven otherwise” whenever you encounter a regular SVT at a rate close to 150/minute. This is the case for the rhythm in Figure 1. Sinus Tachycardia is part of the differential. Most of the time this rhythm is easy to recognize by the presence of a distinct, upright P wave preceding each QRS complex in lead II. Our reason for including sinus tachycardia in the regular SVT List in Table 1 – is that at more rapid rates the P wave may sometimes be hidden within the preceding ST segment. This does not appear to be the case in Figure 1 – in which if anything, a predominantly negative deflection is seen to precede each QRS complex in lead II. Thus, for practical purposes – our differential diagnosis for the rhythm in Figure 1 has been narrowed to 2 entities: AFlutter and PSVT. Statistics and the ventricular rate make us strongly suspect the former. Additional CLUES: On close inspection – the rhythm in Figure 1 is not completely regular. Instead – the 4th beat occurs early (large black arrow in Figure 2). Clinical PEARL: An extremely important clue is often revealed within “the break” of any arrhythmia. A momentary change in the rhythm (even if ever-so-subtle, as after the 4th beat in Fig. 2) – may sometimes provide insight to the underlying mechanism of the arrhythmia that had not been evident initially. This is the case in Figure 2 – where despite the early occurrence of beat #4 in the lead II rhythm strip, underlying flutter waves continue unabated (as seen by the short vertical black lines in the blowup of the lead II rhythm strip). Use of calipers is perhaps the most time-efficient way to check out one’s suspicion that a regular SVT is atrial flutter. Simply set the length of your caliper points to the precise interval of potential flutter activity. The small, vertical red arrows in the blowup of the lead II rhythm strip of Figure 2 show doing so yields perfect “march out” at a rate of ~300/minute. This caliper point interval is exactly half the R-R interval for all beats on the tracing that occur after the early brief momentary break in the rhythm. Confirmation that what we are seeing is truly flutter activity can be forthcoming from detection of flutter waves in other leads. Next to the inferior leads (II,III,aVF) – lead V1 and lead aVR are common sites likely to reveal positive deflections indicative of flutter. This is especially the case for lead aVR in Figure 2 – where 2 small positive peaks are regularly present within each R-R interval. Although 2 small positive peaks are also seen in lead V1 of Figure 2 – superposition of the 2nd flutter peak on the initial portion of the QRS in this lead makes this finding far more subtle. 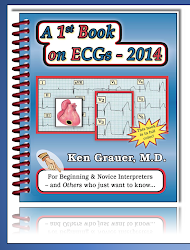 Figure 2: Another look at the ECG in Figure 1. We have labeled this tracing: i) The large black arrow in lead II shows early occurrence of the 4th beat; ii) Blowup of the lead II rhythm strip shows persistent flutter waves despite early occurrence of beat #4; and iii) Small vertical red arrows show regular occurrence of 2 negative deflections for each QRS throughout the rest of the tracing. Flutter activity is also seen in lead aVR, and more subtly in lead V1. Use of Vagal Maneuvers: Final confirmation that the rhythm in Figure 1 is AFlutter with 2:1 AV conduction is forthcoming with use of a vagal maneuver. As discussed in detail in Section 13.0 (pdf excerpted from ACLS-2013-ePub) – this may be done by carotid massage, valsalva, or “chemical valsalva” with diagnostic/therapeutic use of adenosine. The large black arrow in Figure 3 shows what the effect of a vagal maneuver is likely to be for the rhythm in Figure 2. Note transient slowing of the ventricular response from 2:1 to 4:1 AV conduction that clearly reveals underlying flutter activity at ~300/minute (small vertical red lines in Figure 2). Treatment options are explored in the pdfs given in the References below. Figure 3: Application of a vagal maneuver (large black arrow) results in transient slowing of the ventricular response - that confirms underlying flutter at 300/minute (small vertical red lines). 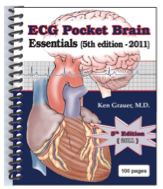 The patient is a 50-year-old man who presents to the ED (emergency department) because of "palpitations". His Lead II Rhythm Strip is shown in Figure 1. The patient has a history of hypertension and is on a diuretic — but he is otherwise healthy. BP = 160/90 mmHg at the time the rhythm strip in Figure 1 is recorded. He has "heart awareness" (which is understandable given his rapid rate) — but otherwise no chest pain and no significant dyspnea. Is the patient in an SVT? IF so — Which one? Should you give Adenosine? If you do and it works — Does this prove that the rhythm in Figure 1 is an SVT? Figure 1: Lead II rhythm strip obtained on a 50-year-old man with palpitations. BP = 160/90. Is this an SVT? How should you proceed clinically? - NOTE - Enlarge by clicking on Figures - Right-Click to open in a separate window. ANSWER: As is the case for clinical evaluation and management of any cardiac arrhythmia — the 1st thing to do is assess the patient! Ensure that the patient is hemodynamically stable! 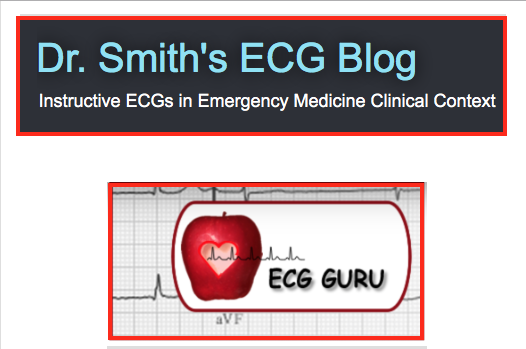 IF the patient is not stable as a direct result of the rapid rate — then electrical therapy (synchronized cardioversion or deﬁbrillation) becomes immediately indicated regardless of whether the rhythm is VT, SVT, or WCT of uncertain etiology. P Waves? 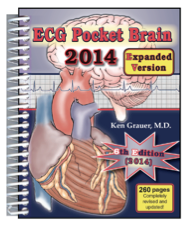 — No P waves are seen (and no sign of atrial activity). QRS width? — Using the deﬁnition that a QRS duration of more than half a large box (>0.10 second) is “wide” — the QRS does not appear to be wide in the lead II rhythm strip shown in Figure-1. Regularity? — The overall rhythm in Figure-1 appears to be regular. Rate? — We estimate the rate in Figure-1 at just over 200/minute (By the “every-other-beat” method — the R-R interval of 2 beats is just under 3 large boxes; therefore ‘half’ the rate is just over 100/minute X 2 = ~210/minute for the estimated rate). Related? 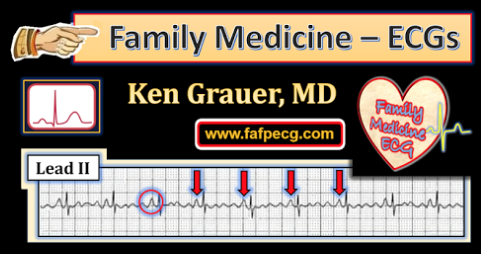 — There is no relation between P waves and the QRS (because there are no P waves to be seen … ). WHAT Should Be Done at this Point? HINT: — Do we know for sure IF the QRS in Figure 1 is wide? The patient is stable — so by deﬁnition, we have at least a moment of time to contemplate management (remaining ever ready to cardiovert the patient IF at any time he becomes unstable). We do not yet know what the rhythm in Figure-1 is. All we know — is that this patient is in a stable Tachycardia (with a regular rhythm but no sign of atrial activity and a QRS complex that does not appear to be wide in the single lead that we see). We could reasonably treat the patient with Adenosine at this point. 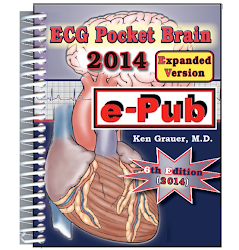 We should obtain a 12-lead ECG during the tachycardia as soon as it is possible to do so. For conciseness — We limit illustration to a simultaneously recorded 2-lead rhythm strip of lead II and lead V1 (Figure-2). Do you still think the QRS complex in Figure-1 is narrow? How will the answer to this question affect your clinical approach? Figure-2: Simultaneously-recorded rhythm strip of leads II and V1. Do you still think this patient is in a narrow-complex tachycardia? The reason we were able to take the time to obtain additional leads on this patient — is that he was hemodynamically stable and tolerating the tachycardia in Figure-1. IF the patient was not stable (or at any time became unstable) — synchronized cardioversion would have been immediately indicated. Some patients may remain stable despite being in Tachycardia for an extended period of time (Cases of documented VT that persist for hours or longer are not uncommon). Knowing this — and knowing what to do IF at any time in the process the patient decompensates — affords the emergency care provider the luxury of at least a moment of time to contemplate further management. Optimal Management of Tachycardia depends on accurate Rhythm Diagnosis. 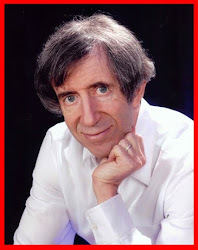 This is not to say that management can't proceed before a deﬁnite diagnosis of the rhythm is made — but only that optimal management is best undertaken when the likely rhythm diagnosis is known. Once you have ensured that the patient with Tachycardia is stable — Use of the 5 KEY Parameters facilitates rhythm diagnosis (and allows you to narrow your differential even if unable to be absolutely certain of the rhythm). 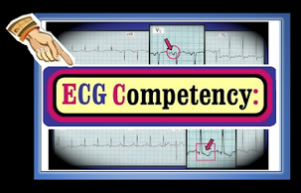 Therefore — “Watch your Ps and Qs — and the 3Rs” (Look for P waves or atrial activity — assess QRS width — determine Rate and Regularity of the rhythm — and if P waves are present, assess the Relationship [if any] between P waves and the QRS). Note: It does not matter in what sequence you look for these 5 parameters — as long as you always look for all 5 of them in every rhythm you encounter (We often alter the sequence we use depending on which parameters are easiest to identify for the rhythm at hand). Determining QRS Width is a KEY component for assessing Tachycardia. Remember — “12 Leads are Better than One”. Part of the QRS may lie on the baseline in the single monitoring lead being used (as was the case in Figure-1). IF the patient in Tachycardia is stable — Obtaining a 12-lead ECG during Tachycardia will often be revealing (and clarify IF the QRS is wide — as well as whether or not atrial activity is present). BOTTOM LINE: Figure-1 is Really a Regular Wide Tachycardia! The 2-lead rhythm strip shown in Figure-2 conﬁrms that the 50-year-old man in this case is actually in a stable WCT rhythm (Wide-Complex Tachycardia). VT (Ventricular Tachycardia) must be assumed for the rhythm in Figure-1 until proven otherwise. This case brings home the point that “SVT” can not be diagnosed until one is certain about QRS width – and – one can not be certain the QRS is narrow until all 12 leads are seen to be narrow on a 12-lead ECG obtained during the tachycardia. Adenosine can still be given for the rhythm in Figure-1, even after we realize that the QRS is wide. This is because between 5-10% of VT rhythms are adenosine-responsive (See References below). That said — Once we realize that the QRS is WIDE (and that VT is far more likely than SVT) — our treatment priorities change to management of the regular, stable Wide-QRS Tachycardia).